Two researches that were ordered from the University of Chemistry and Technology Prague by the Ministry of Agriculture of the Czech Republic dealt with dual quality of food. Their results were published this year in July and October. There were many products that underwent the tests in the categories of baby food, diary, meat or fish products, washing powders, retail chains' private brands. Individual products were bought in the Czech Republic, Germany, Austria, Slovakia, and Hungary. Based on the first test it was found out that 13 products out of 21 tested products were different, 5 were slightly different and 3 were identical. The second test in October 2017 showed that 11 products out of 21 tested products were different, 3 were slightly different and 7 were identical. The tests for example revealed that so call luncheon meat from Germany contains pork meat, whereas the "same" can from Czech stores is full of mechanically separated poultry meat. Also German fish fingers have bigger meat content compared to Czech fish fingers. Ketchups contain different quantities of tomatoes. Spaghetti for Czech and Slovak markets are made from common wheat, whereas for Austrian market they are made from durum wheat of better quality. 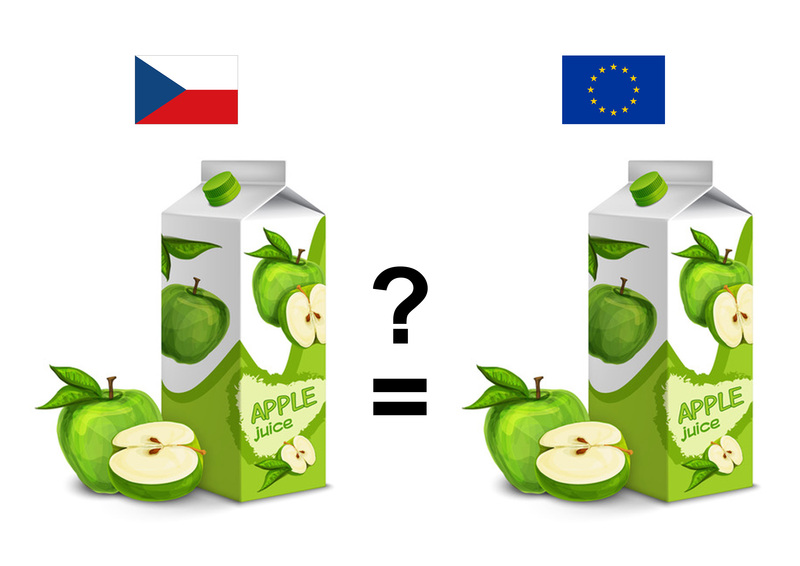 The same conclusions of dual quality of food in the EU were found in Slovakia too. Here the foods bought on the territory of Austria were compared with those bought in Slovakia several times recently. The European Commission recently stated that they consider dual quality of food and goods a significant problem and will pay their full attention to it. Brussels will even provide the member states with up to CZK 50 million for testing the quality of food and other goods. According the Marian Jurečka, the Czech Minister of Agriculture, a change of European legislation would be the best solution to avoid dual quality of food in the EU. However, currently there are no fixed rules anchored to European legislation that would prevent "operating" of dual quality of food so no breach of regulations is concerned. Independent company QSL focuses on food quality inspections and on their correct labelling in compliance with the laws in the Czech Republic. In the future we will certainly see changes in the sphere of food labelling and legislation amendments that will solve the issue of dual quality of food and other products within the EU.